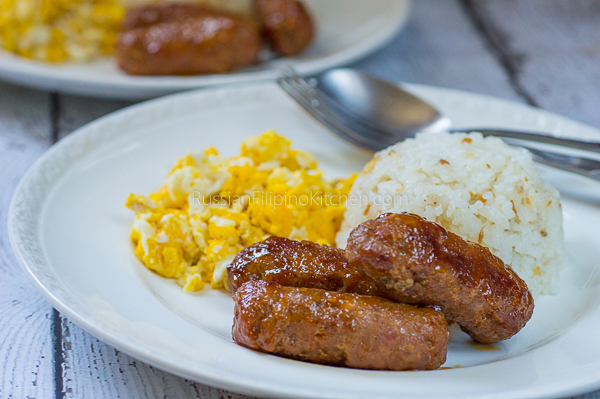 The first time my husband tried both Filipino-style sausages–chorizo (soriso in my native Cebuano dialect) and longganisa, he loved it but somehow couldn’t help noticing their mild sweet taste. Most sausages he tried didn’t have that distinct taste. I explained to him that there are variations in the flavor, depending on the region it was made in Philippines. The ones that I’m familiar with and grew up eating were garlicky, and salty sweet. Chorizo and longganisa are relatively the same taste-wise and are traditionally made from pork and pork fat and a combination of local spices. 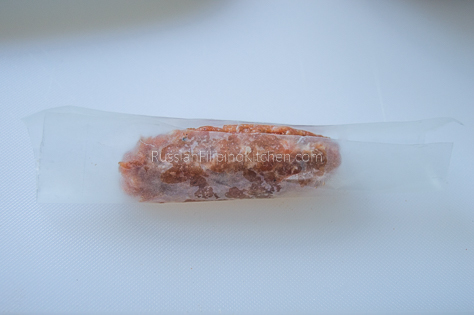 Chorizo can be distinguished from longganisa by its casing. 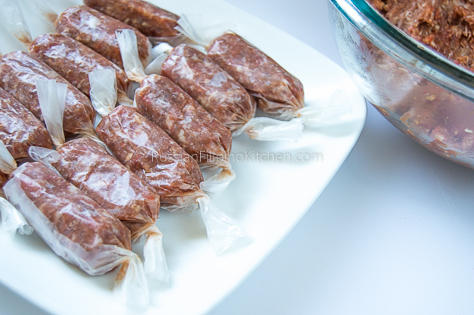 The former being stuffed in hog casings, and longganisa in thin plastic film which are removed prior to cooking. The latter can also be made without the casing especially when made at home for personal consumption–hence the term “skinless”. 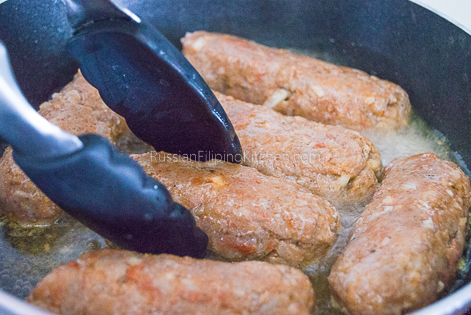 This longganisa recipe is fairly easy to make. All you have to do is mix everything together and shape the mixture into small logs. Then you can refrigerate them to cure up to 3 days. I started making this way back in 2008 when a fellow Filipina who came to the US the same time as I was introduced me to the process. 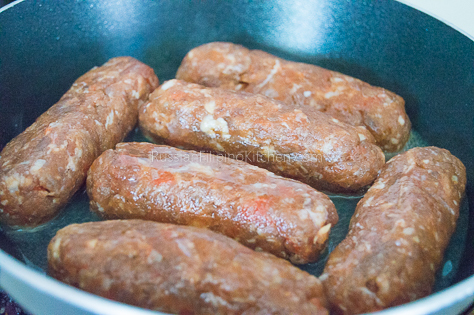 Keep in mind that “pork fat” makes the longganisa moist, and taste better in my opinion. 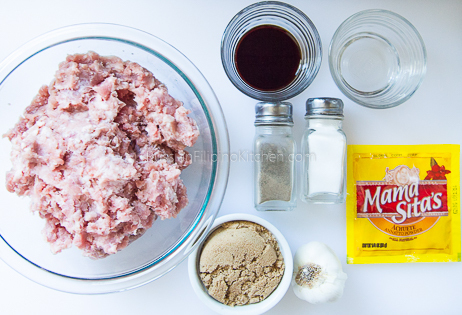 I grind my own meat so I prepare the lean pork and fat separately and mix them together afterwards. I strive to do a 75% lean meat and 25% fat ratio. 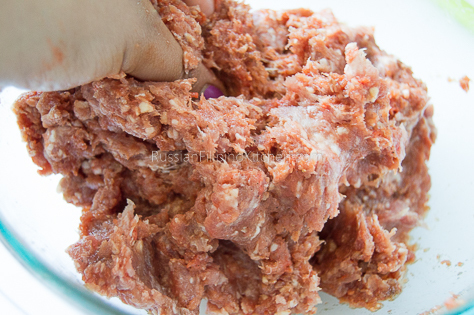 So when I’m making 2 lbs or about a kilo of longganisa, I use 1 1/2 lb of lean meat and 1/2 lb of pork back fat. 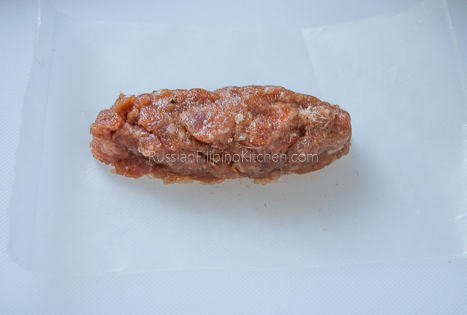 However, if you want the healthier version, you can do 100% lean but your longganisa will be a little dry and rubbery after frying. You can choose not to wrap the longganisa. Just scoop out the mixture and place into your palm, roll into a log, then place in an airtight container with cover. In order to prevent the sausages from sticking to each other, place something between each layer such as wax paper, parchment paper, or even aluminum foil. Cut up 30 pieces 5" x 3" rectangles of wax paper. 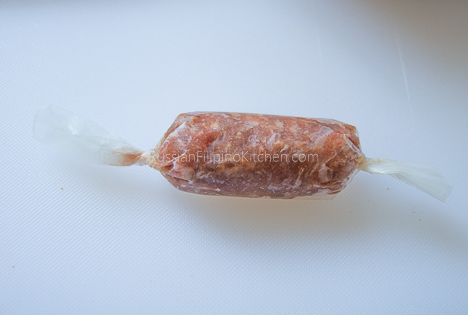 You will use this for wrapping the individual longganisa. Set aside till ready to use. This step is optional but I suggest doing this so the sausages don't dry out while refrigerating/freezing. 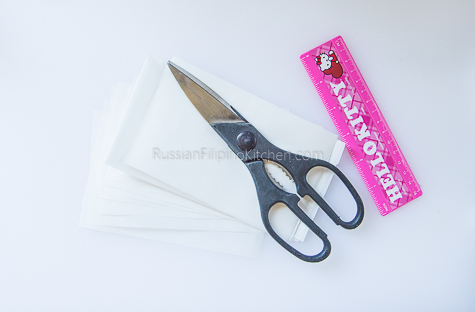 Other alternatives for wax paper are plastic cling wrap or ice candy bags. 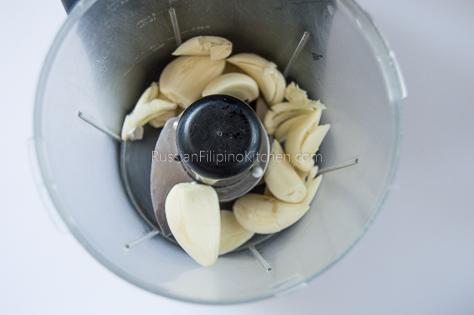 Prep the ingredients: Peel garlic cloves and chop until very fine. A food chopper is perfect for this task vs manually doing it with a knife. 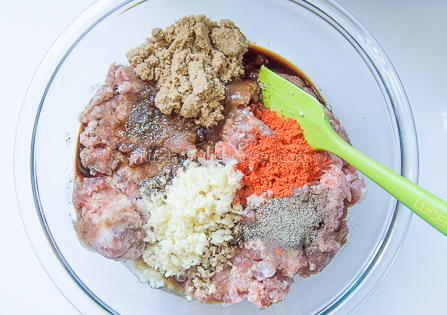 Place all the ingredients (ground pork, chopped garlic, sugar, achuete powder, soy sauce, vinegar, salt, ground black pepper) into a large mixing bowl and mix everything until well-combined. 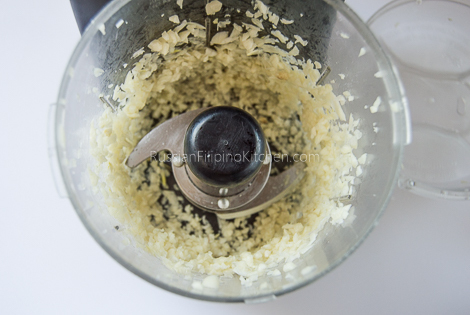 Scoop about 1½ tablespoon of the mixture into a sheet of wax paper. Roll into a log and twist both ends to seal. Repeat until all the mixture is wrapped. Place in an airtight container and refrigerate for up to 3 days for better flavor. 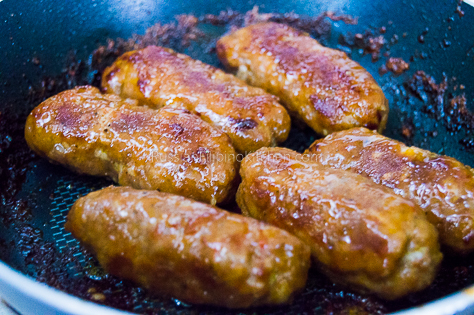 To cook the longganisa, simply peel individual sausages and arrange in a single layer in a shallow frying pan or skillet. Add a little water and cook over medium heat until all the water has evaporated. The longganisa will cook in its own fat. Turn over several times while frying until they turn golden brown.